Artsybashev Keratoconus Center – Решение проблемы кератоконуса путем управляемой регрессии болезни. 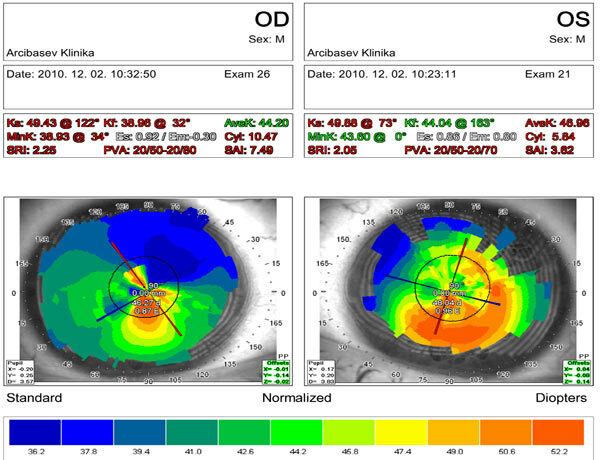 Ambulatory ophthalmology center established by Academician Sergey Artsybashev for his highly specialized surgical solution for keratoconus stage I – IV. 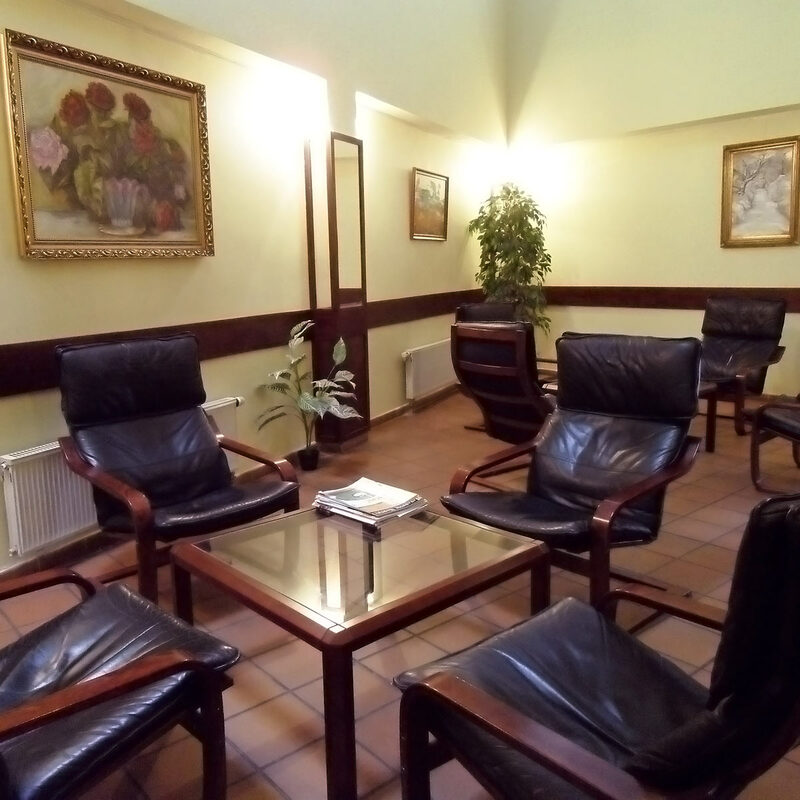 The Keratoconus Center was formed on the basis of Artsybashev Ophthalmology Clinic, which was established in Budapest in 1994 and has twenty five years of experience treating keratoconus patients from around the world. 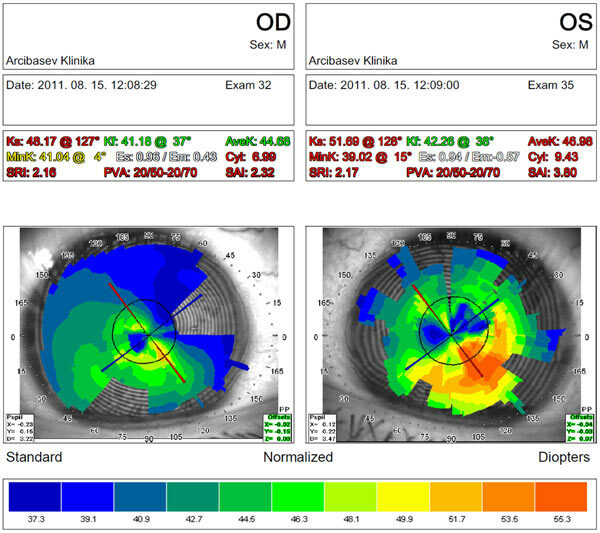 Artsybashev’s keratoconus method of diamond surgery is intended simultaneously to stop the development of keratoconus and significantly improve vision (uncorrected visual acuity). generally not required for stabilization of results and prevention of corneal transplant or keratoplasty (PK, DALK). 1. Examination and Consultation (requires 30 to 60 minutes). 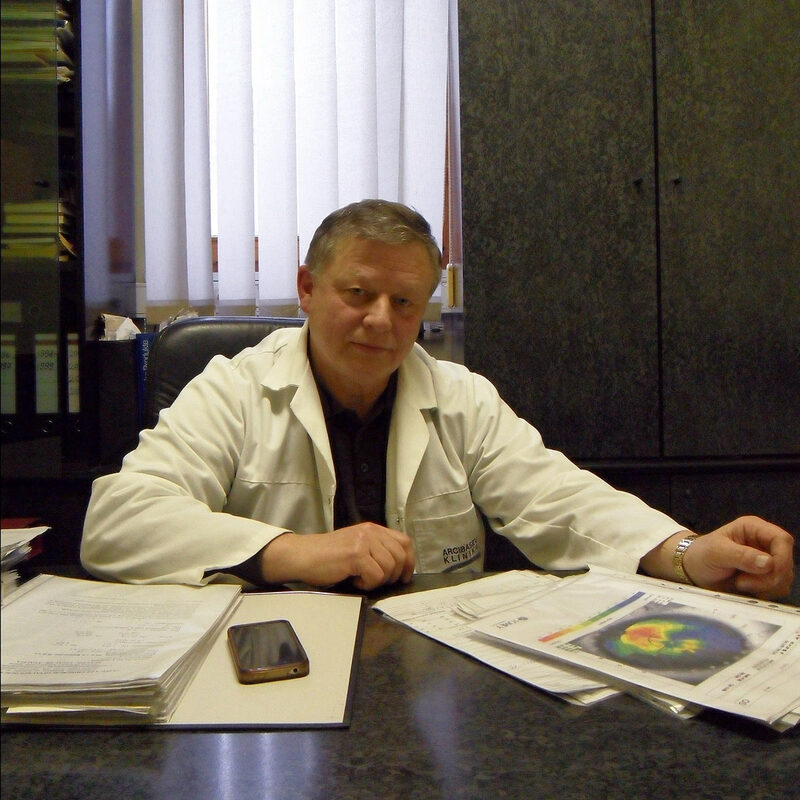 Following a complete ophthalmologic examination Dr. Artsybashev will inform the patient of his findings and discuss possible surgical intervention and prognosis of its results. 2. 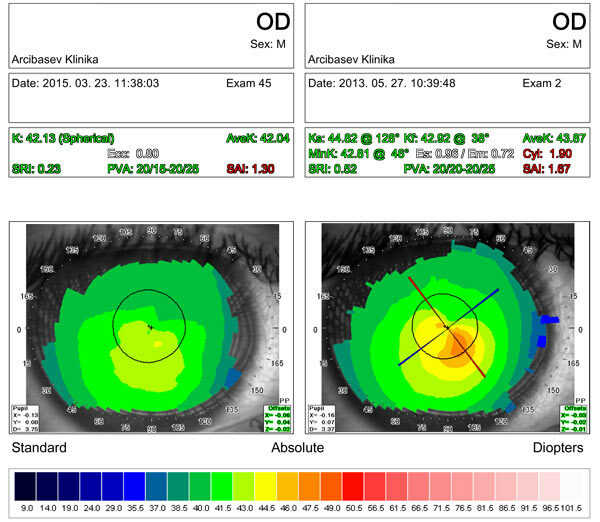 Ambulatory diamond surgery by Artsybashev’s keratoconus method (requires 2 to 3 minutes per eye). If both eyes are treated the second eye is operated on the following day. • Day 3: remove the bandage from the second operated eye, check-up and statement. 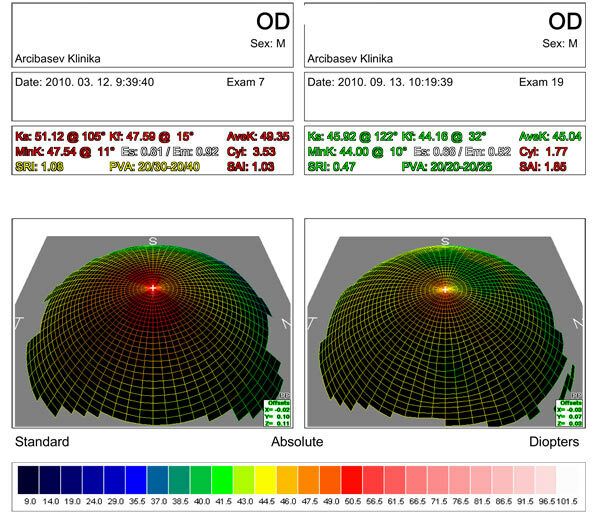 Our patients receive electronic results of corneal topography before and after surgery. 3. Follow-up examinations and observation of the patient during the rehabilitation period. Dr. Artsybashev conducts follow-up examinations after surgery at intervals of 1 month, 3 months, 6 months, 1 year, 2 years if possible. 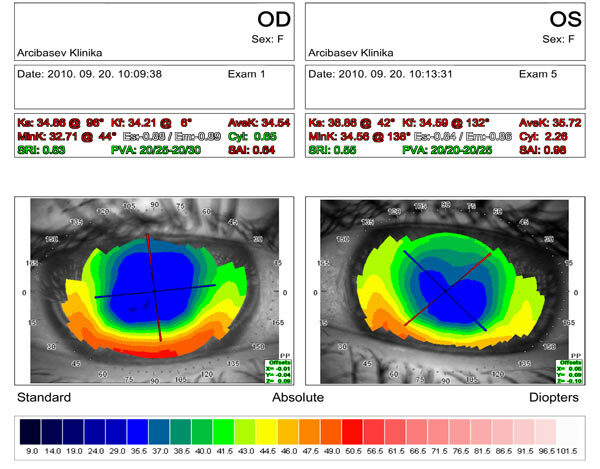 Progressive keratoconus stage II, O.D., after corneal crosslinking (CXL). 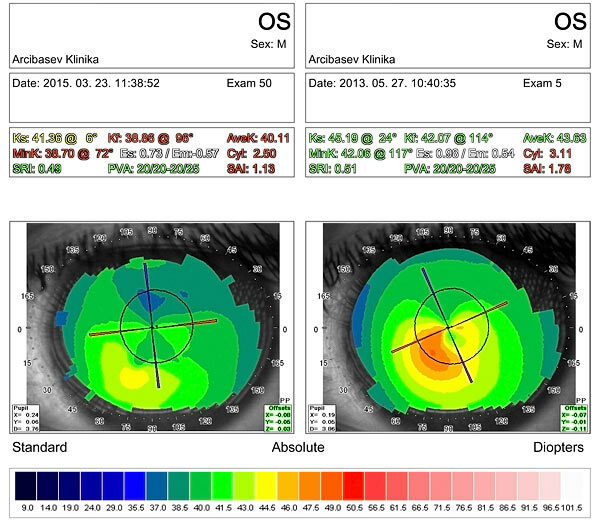 Progressive keratoconus stage III, O.S., after corneal crosslinking (CXL). 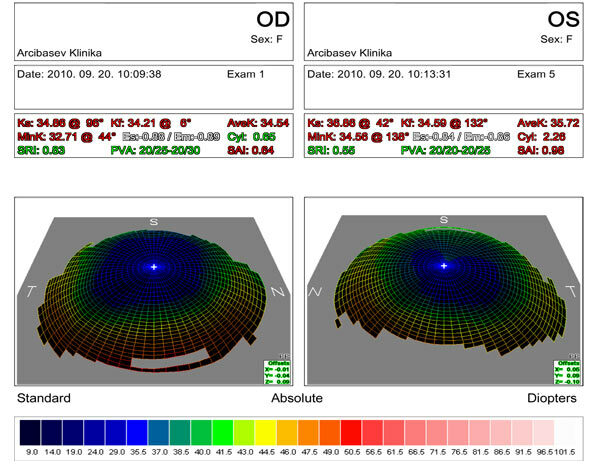 Progressive keratoconus stage III, O.D., after implantation of intrastromal corneal ring segments. 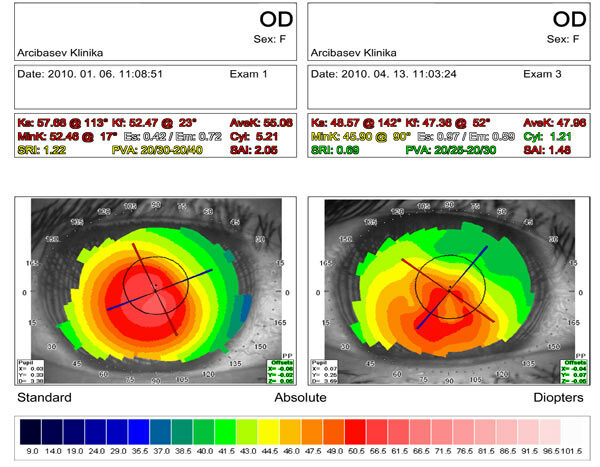 Recurrence of keratoconus after corneal transplant. 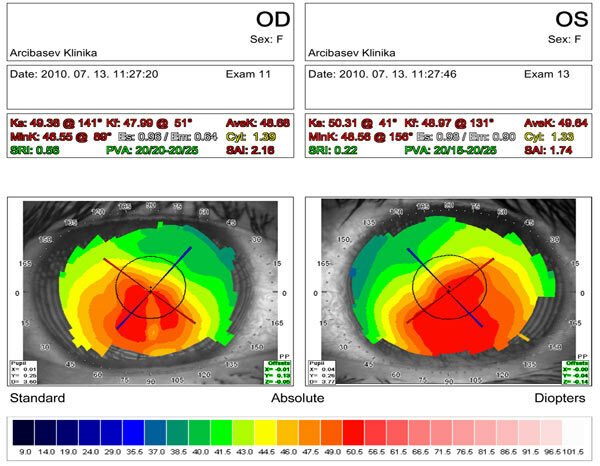 Keratoconus is a progressive, non-inflammatory (degenerative) disease of the cornea (the Greek. Kerato-), where due to thinning and weakening it eventually becomes cone-shaped and more convex. As a result of this process, vision deteriorates. 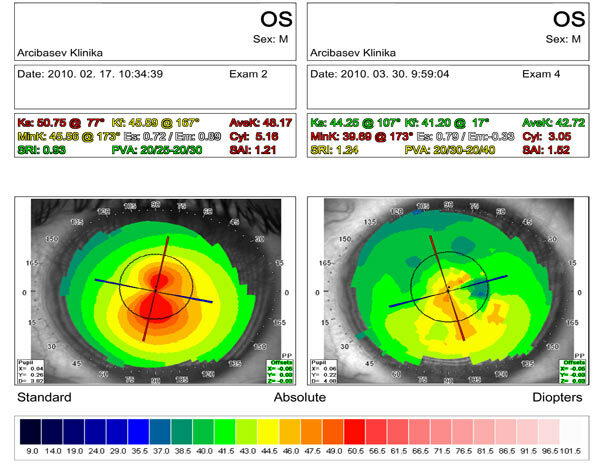 Keratoconus is highly variable in its speed and rate of progression in case of each eye. 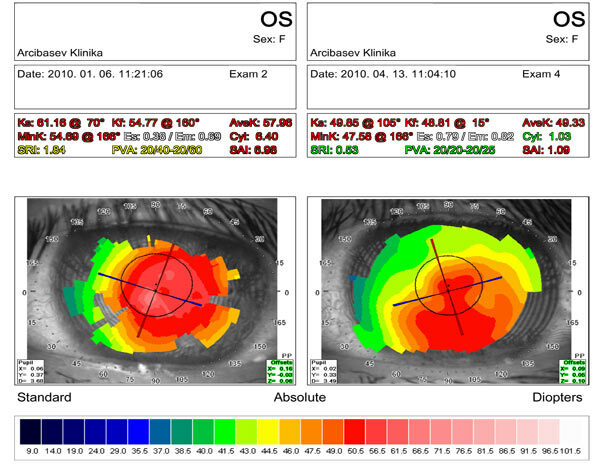 Keratoconus is the most common indication for corneal transplantation (keratoplasty) among all eye diseases. 2. 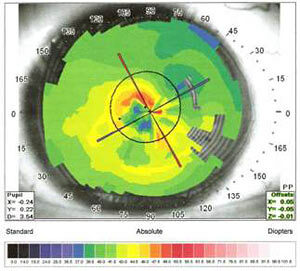 What could be the cause of keratoconus? 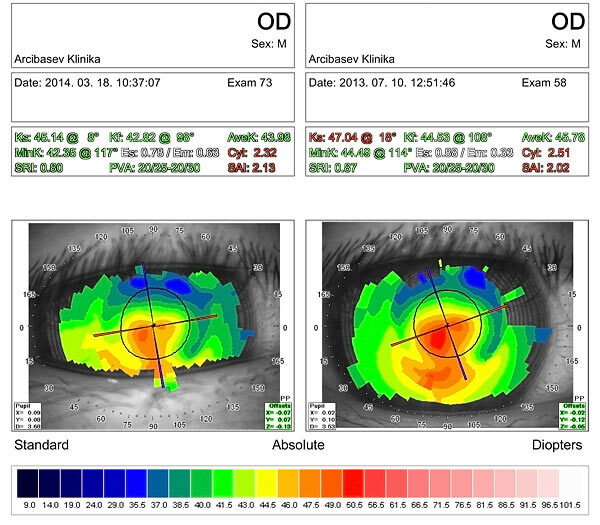 Keratoconus may be primary or secondary by origin. It is impossible to identify the specific reasons for the occurrence of primary keratoconus; heredity, immune, endocrine factors, stress, and environmental influences may play a role. The process is chronic and usually affects both eyes. Causes of secondary keratoconus may be: corneal thinning as result of medical interventions, infections (bacteria, viruses, fungi and parasites), inflammation, trauma, or eye rubbing. 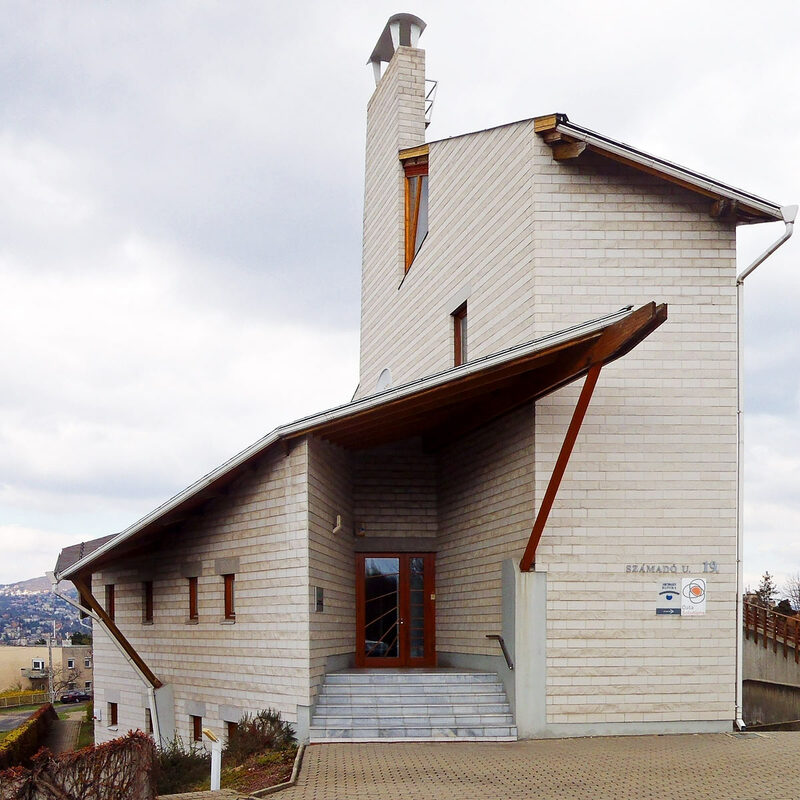 The process is most often acute and one-sided. 3. 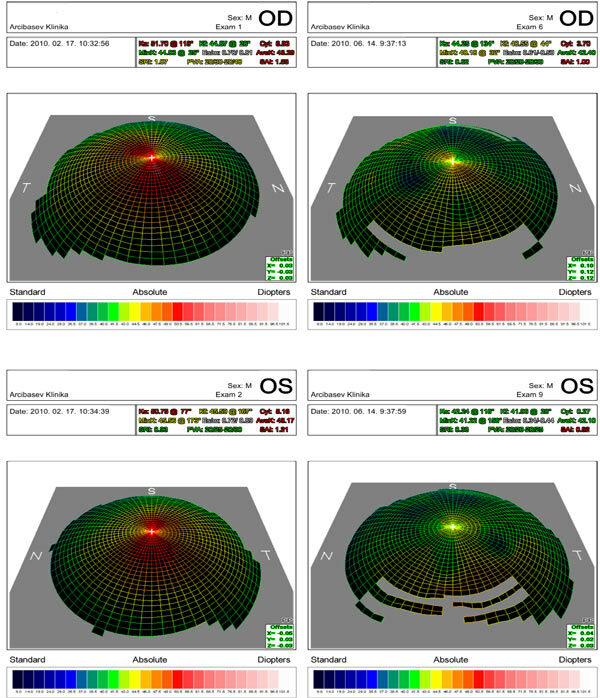 Is it possible to simultaneously stop the development of keratoconus, steadily improve vision, prevent corneal transplant, and get rid of hard contact lenses? 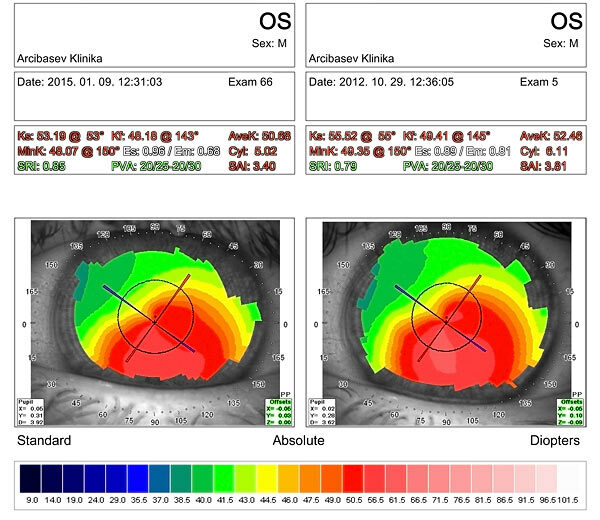 Yes, there is a one-step therapeutic solution to the problem of keratoconus. 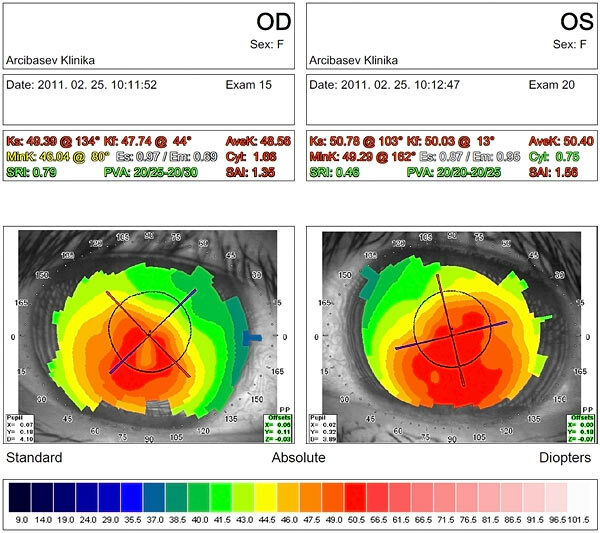 Simultaneous improvement of vision, without any additional and subsequent interventions. 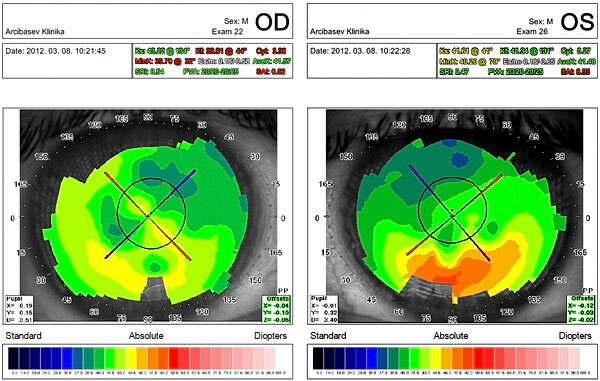 Both conditions are met by the special Artsybashev’s keratoconus method used in his Center. 4. 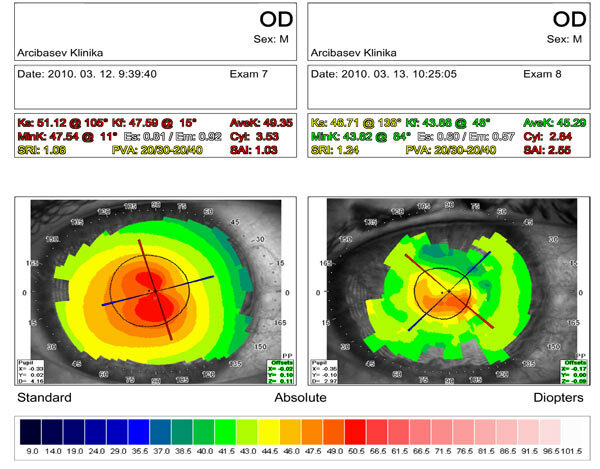 What is unique of Dr. Artsybashev’s keratoconus method of diamond surgery? 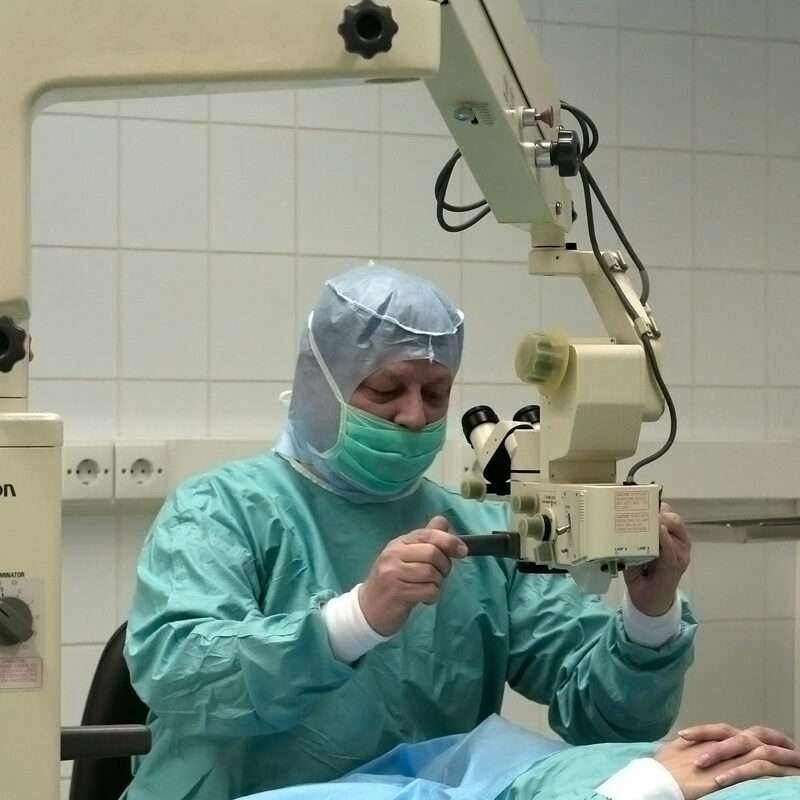 Currently Dr. Artsybashev is the only eye surgeon who possesses the skills and more than 30 years of experience in the application of this method. He has performed over 1,000 such operations for keratoconus stages from I to IV. 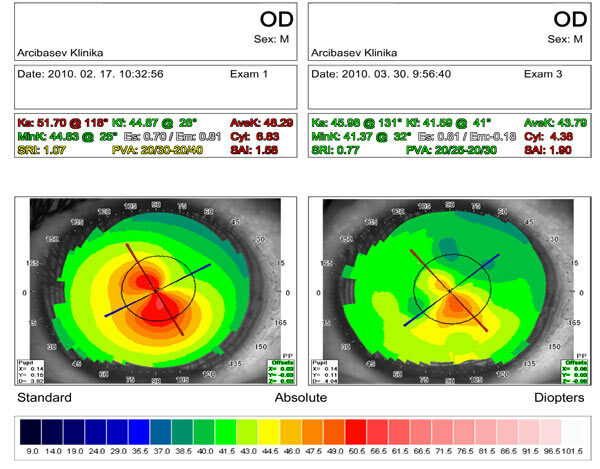 Dr. Artsybashev developed the keratoconus method of diamond surgery on the basis of his experience with radial keratotomy and introduced it for the treatment of patients with keratoconus. 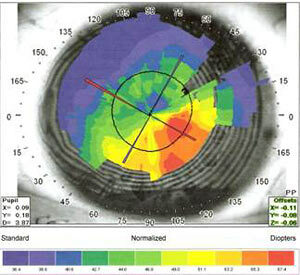 In order to master this surgical technique and apply it to the treatment of keratoconus, he performed tens of thousands of refractive surgery aimed at correcting the optical functions of the cornea for patients with myopia (nearsightedness) and astigmatism, including the ultra-thin corneas. 5. 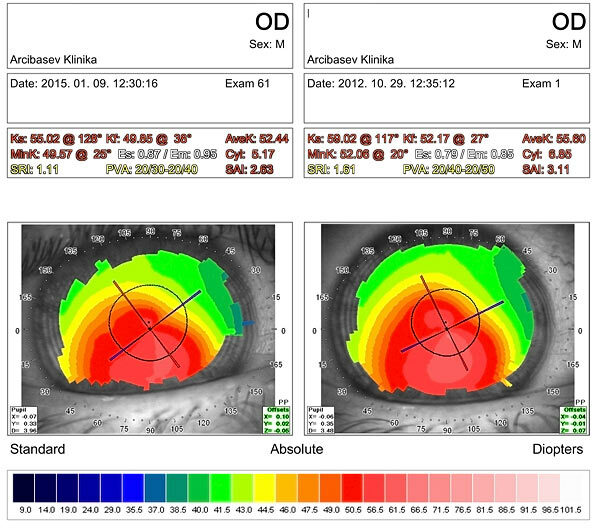 What is the goal of Dr. Artsybashev’s surgery for keratoconus? The goal of his one-step intervention is simultaneously to stop the disease process of keratoconus, improve vision (uncorrected visual acuity), and prevent corneal transplant. 6. 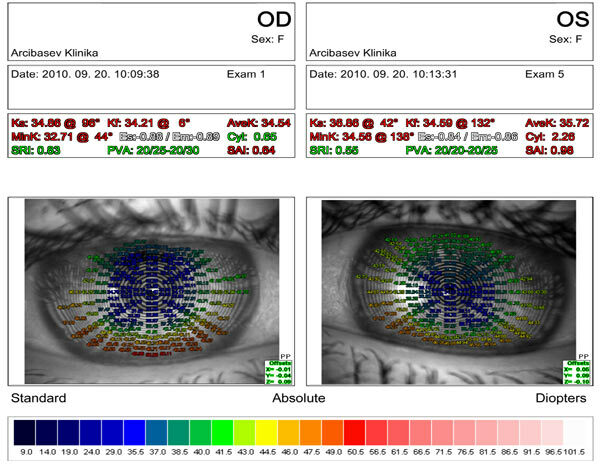 What is the principle of Dr. Artsybashev’s operation for keratoconus? function, i.e. they contribute to the strengthening of the cornea and stopping the process of its protrusion and thinning. 7. 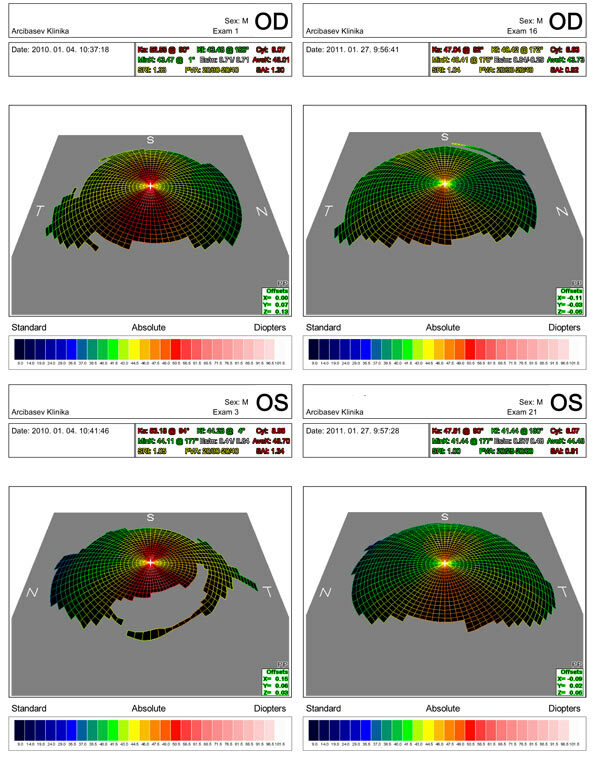 What is the technique of Dr. Artsybashev’s keratoconus method of diamond surgery? with the micrometric submission, they are visible only under an electronic microscope. An incision on the cornea is atraumatic, ultra thin, and can be seen only under high magnification. Healing after such an intervention is very fast because of the delicate and short-term mechanical effect on the corneal tissue. 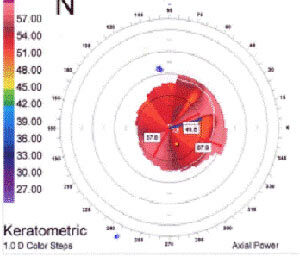 Keratoconus method of diamond surgery is a modification of the classical method of radial keratotomy, developed by Academician Svyatoslav Fyodorov and successfully applied in the world for over 30 years including the present. 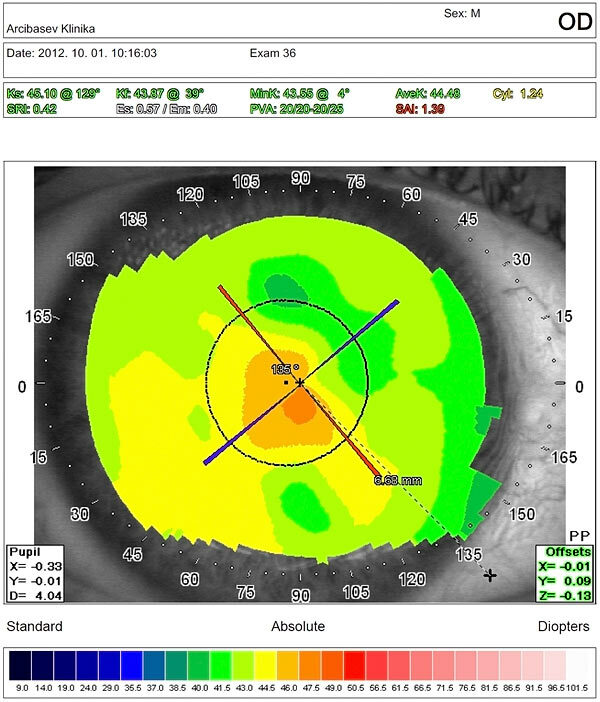 Keratoconus technique of diamond surgery differs from the classical radial keratotomy by providing a shorter duration of surgery, a gentle technique, and a lesser degree of trauma. 8. 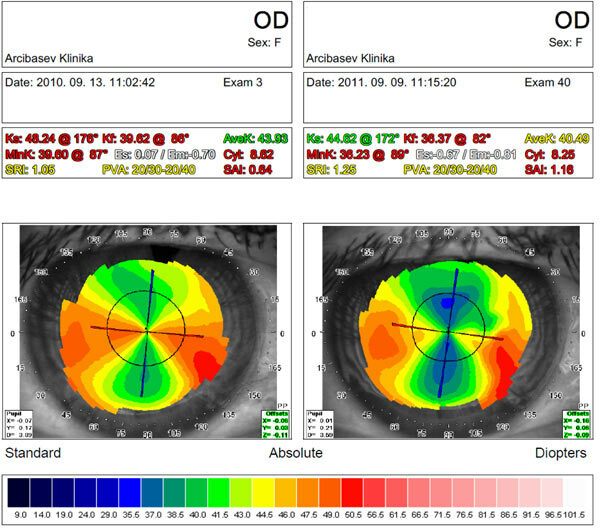 When should patients with keratoconus refer to Dr. Artsybashev? 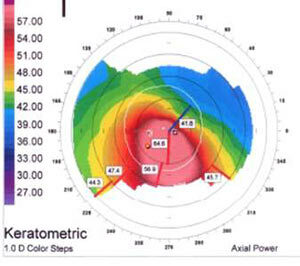 Dr. Artsybashev operates patients with keratoconus stages from I to IV. He has performed more than 1,000 operations at stages I – IV of keratoconus, including after corneal crosslinking (СXL), implantation of intrastromal rings (ICRS), laser procedures, corneal transplantation and keratoplasty. 9. When will there be a noticeable effect of Dr. Artsybashev’s operation? 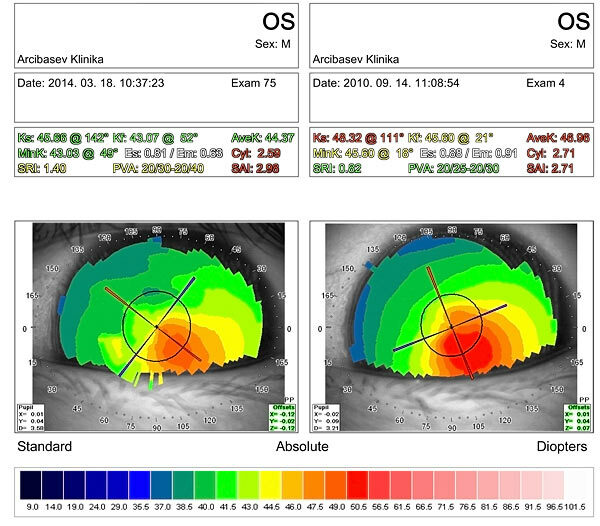 is important to stay compliant with Dr. Artsybashev’s recommendations following surgery. 10. How stable are the results of Dr. Artsybashev’s surgery? 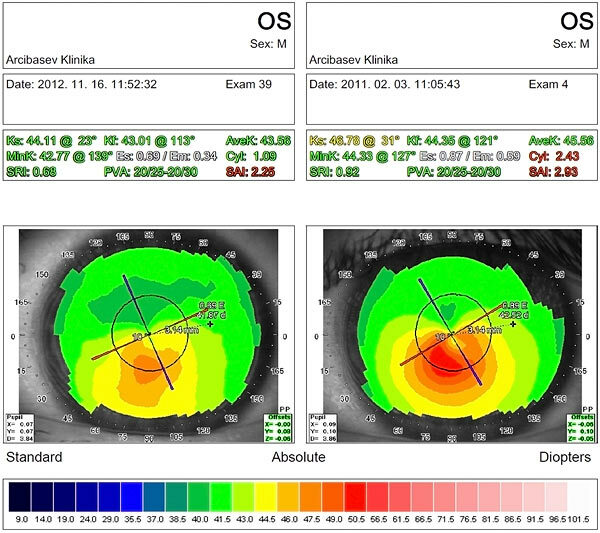 Keratoconus method of diamond surgery has long-term results for over 20 years. Express, JCB, Union Pay, OTP.